Safe Routes to School is a national, state, and county-wide effort to promote walking and biking to school and making walking to school, safe, popular, and fun for families. In an effort to decrease traffic congestion around schools and increase safety, academic performance and wellness for HCPS students, the Transportation Department has collaborated with Hillsborough MPO School Transportation Work Group (STWG) chaired by Board member Cindy Stuart. Roosevelt Side Walk Stompers - Watch Video! Palma Ceia Sidewalk Stompers powers community building and safer pedestrian pathways via school-based walking programs and public advocacy. 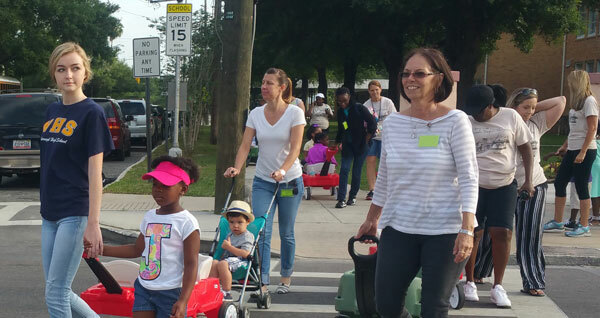 Supported by the school's PTA and the Palma Ceia Neighborhood Association, SideWalk Stompers started "Walk to School Wednesdays", in an effort to make a once-a-week walk to school part of the routine. To learn more visit https://www.pcsstompers.org/. October 10th, join students, families, school leaders and community partners in celebrating the benefits of walking to school during International Walk to School Day. The goal of this day is to raise awareness and support for health, community and environmental benefits of regularly walking or biking to school. Help Hillsborough County Public Schools make Debbie Caputo, America's Favorite Crossing Guard! International Walk to School Day encourages students around the world to get out and get moving, combating childhood obesity by upping students' activity levels. It is celebrated internationally on October 4th to promote the importance of physical activity by engaging schools, students, and communities. This one-day event is geared toward creating change in community culture and creating mobility and transportation options for all. While the event only occurs once per year, it's a conversation starter and change initiator for schools and communities. Join HCPS in the movement!